I love bread. I love all kinds of breads. I love bread with butter. I love bread with oil. OK, I think you get the picture. It satisfies me. I can make a meal of it. 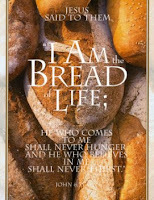 King Jesus, the Messiah, satisfies me like bread can never do. My soul hungers for right standing with our heavenly Father. Jesus takes care of that for me so that I never have to hunger for right standing anymore. That longing is fulfilled completely. God is so good to us to satisfy our every need and desire. It is all about Jesus. He is the real deal. He is everything I need to be right with our Father. It is ALL about Him. He is life. He satisfies my hunger.